The legend of Studio Ghibli requires almost no introduction. The Japanese animation outfit that has brought the world the likes of My Neighbor Totoro, Spirited Away and Princess Mononoke is well-established as an animation giant, and any film they release automatically demands a look-- you just never know when the next Porco Rosso is going to come your way. How do you enter? Just click on over to our Facebook page, "Like" it if you haven't already, and then leave a comment on this contest post. 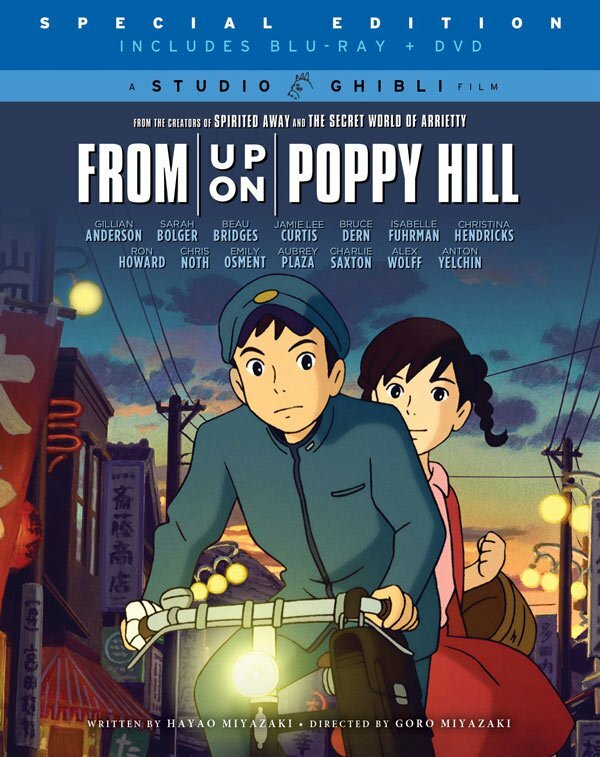 Tell us why you deserve to win From Up On Poppy Hill on Blu-ray and we'll pick five winners at random. The contest ends at 12 am EST on Monday, August 26th. If you enter, please make sure we can contact you via Facebook. If you have it set to where we can't message you, your prize will go to somebody else. Prizes will be shipped in time for the Blu-ray's release on September 3. From the legendary Studio Ghibli, creators of Spirited Away, Howl’s Moving Castle and The Secret World of Arrietty, comes another animated triumph. Yokohama, 1963. Japan is picking itself up from the devastation of World War II and preparing to host the Olympics. The mood is one of both optimism and conflict as the young generation struggles to throw off the shackles of a troubled past. Against this backdrop of hope and change, a friendship begins to blossom between high school students Umi (Sarah Bolger) and Shun (Anton Yelchin)– but a buried secret from their past emerges to cast a shadow on the future and pull them apart. From a screenplay by Academy Award®-winner Hayao Miyazaki and featuring an all-star English voice cast!